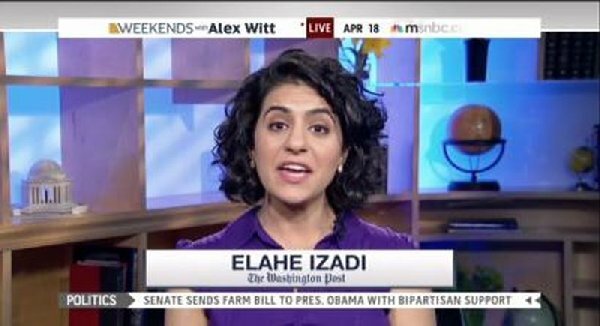 Washington Post reporter Elahe Izadi showed what a dimwit she really is by going on MSNBC and claiming that Kansas restricting how the poor use food stamps is mean-spirited and how they should not be told how to spend their money. The only problem with that is it is not their money. It is taxpayers’ money and the states have an absolute right and an imperative to dictate how that money is spent. Welfare is not meant to be an all-you-can-eat buffet of entitlements that are claimed as your own and spent however you like. It is meant to give you food and shelter until you can get on your feet again. Izadi is a typical Marxist, liberal media twit. The Washington Post might want to start vetting their reporters. But what do you expect from a news organization that won’t vet anyone with a “D” after their name? On Saturday, MSNBC’s Alex Witt hosted Washington Post reporter Elahe Izadi to blast a new Kansas law that would limit what items welfare recipients could purchase using their taxpayer benefits. Since when did food stamps, paid for by taxpayers, become the unalienable property of poor recipients? Once we begin seeing welfare as the poor’s “own money,” to manage as they will without limitation or check, we have destroyed the entire basis for property rights in this country. Once my property becomes your property by fiat, and I can no longer protest or control its use by you, through the law, then the property rights of everyone are endangered. I’m sure this little girl reporting for the Washington Post has no trouble with government taking money earned by the middle and wealthy classes of America. That’s not “your” money, after all, as it’s redistributed to the hands of the poor. But once given to the poor, “your” money now becomes “their” money, and you are mean spirited to protest or complain how they decide to spend it. Why is it mean spirited to want to keep what you’ve earned, but not mean spirited to want to take what others have earned? 1. It should only be for those who truly need it. The Founders believed government had an obligation to the governed to provide a safety net, but only for those individuals incapable of providing for themselves, like widows, orphans, the elderly, and the mentally and physically handicapped. If you were capable of working, and refused, government owed you nothing. 2. It should be the bare minimum. The Founders believed that government should provide the basic necessities of life for those who were incapable of providing for themselves, but it would only be the bare minimum. This meant that you would have food to eat and a place to sleep free of charge, but nothing much beyond that. In other words, welfare was not meant to be comfortable. 3. It should be done at the state and local level, NEVER the national. The Founders believed that the form of government closest to the individual could best take care of the individual if necessary. This meant all welfare would come from the local and state authorities. The national government was too remote and too general to ever be suited to providing welfare. As a result, poor houses, orphanages, and insane asylums were built by local authorities, at public expense. Churches and neighborhoods also gave some relief. Today, we have completely abandoned the Founders’ system. The federal government is restricting charity and local churches from helping the poor so they can control them through entitlements. To claim all potential reform of food stamps and welfare benefits is mean to the poor and keeps them from spending their own money is a specious argument. When Maine required that their welfare recipients that were able to work, earn their welfare benefits, those welfare roles dropped by 80%. There is nothing wrong with expecting exchange for money given to you. That’s called work – government money is not the recipients’ money – it is the money of hard working taxpayers giving them a handout. There’s a big difference.